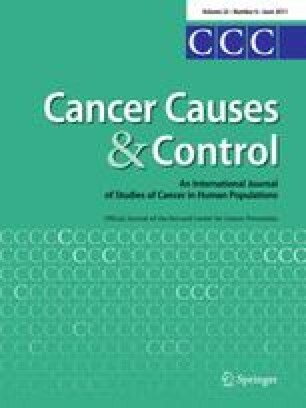 Evidence from case–control studies, but less so from cohort studies, suggests a positive association between meat intake and risk of lung cancer. Therefore, this association was evaluated in the frame of the European Prospective Investigation into Cancer and Nutrition, EPIC. Data from 478,021 participants, recruited from 10 European countries, who completed a dietary questionnaire in 1992–2000 were evaluated; 1,822 incident primary lung cancer cases were included in the present evaluation. Relative risk estimates were calculated for categories of meat intake using multi-variably adjusted Cox proportional hazard models. In addition, the continuous intake variables were calibrated by means of 24-h diet recall data to account for part of the measurement error. There were no consistent associations between meat consumption and the risk of lung cancer. Neither red meat (RR = 1.06, 95% CI 0.89–1.27 per 50 g intake/day; calibrated model) nor processed meat (RR = 1.13, 95% CI 0.95–1.34 per 50 g/day; calibrated model) was significantly related to an increased risk of lung cancer. Also, consumption of white meat and fish was not associated with the risk of lung cancer. These findings do not support the hypothesis that a high intake of red and processed meat is a risk factor for lung cancer. The work described in the paper was carried out with the financial support of the “Europe Against Cancer” Programme of the European Commission (SANCO); Ligue contre le Cancer (France); Société 3 M (France); Mutuelle Générale de l’Education Nationale; Institut National de la Santé et de la Recherche Médicale (INSERM); Institut Gustave Roussy; Deutsche Krebshilfe; Deutsches Krebsforschungszentrum; German Federal Ministry of Education and Research; Danish Cancer Society; ISCIII of the Spanish Ministry of Health (RETICC DR06/0020); Health Research Fund (FIS) of the Spanish Ministry of Health; the Spanish Regional Governments of Andalucia, Asturias, Basque Country, Murcia and Navarra; Cancer Research UK; Medical Research Council, UK; the Stroke Association, UK; British Heart Foundation; Department of Health, UK; Food Standards Agency, UK; the Wellcome Trust, UK; Hellenic Ministry of Health; Stavros Niarchos Foundation; Hellenic Health Foundation; Italian Association for Research on Cancer; Italian National Research Council; Dutch Ministry of Public Health, Welfare and Sports (VWS), Netherlands Cancer Registry (NKR), LK Research Funds, Dutch Prevention Funds, Dutch ZON (Zorg Onderzoek Nederland), World Cancer Research Fund (WCRF), Statistics Netherlands(The Netherlands); Nordforsk; Swedish Cancer Society; Swedish Scientific Council; Regional Government of Skane and Västerbotten, Sweden.